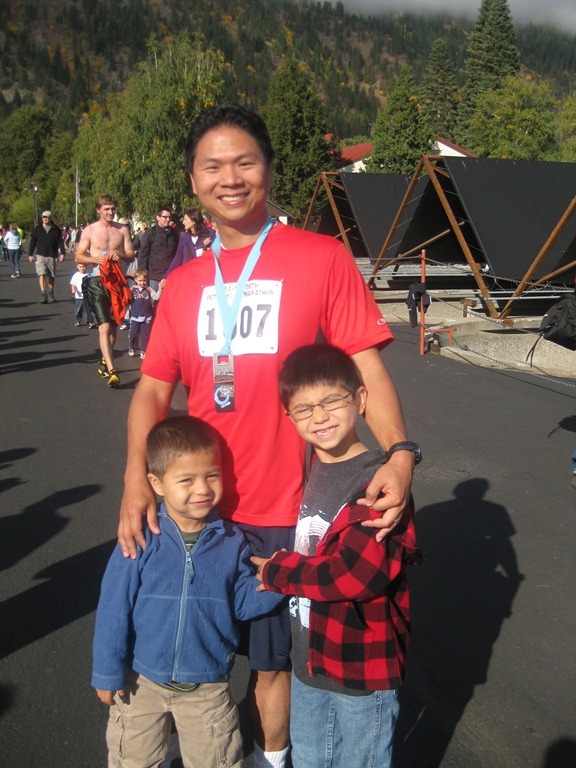 In October, our family took a weekend trip up to Leavenworth for the annual half-marathon run. As far back as I can remember when I started running “for fun”, I have always hovered around a 10 minute mile pace, but a few months ago, Tenille asked me, “How fast do you think you can run?” I answered, “I don’t know.” I’ve never really tried to run fast. 1. It was hard, and 2. I didn’t want to hurt myself. But, for some reason that evening, I went out to the Redondo boardwalk and tried to run 3 or 4 miles – and answer the question. I found I could run about a 9 minute mile pace and keep it going the whole time. This was a bit surprising to me. Even more surprising, it felt like I could even go faster and maybe even longer if I really tried. The following week, I went out to the track and started timing myself. After several attempts, it ended up that if I started off at a slower place (to pace myself), I would almost always run slower on the last mile than if I really pushed myself on the first few miles. I thought that a good goal would be to try and run the half-marathon under 2 hours. That would be an average of a 9 minute mile with a few minutes to spare. To really motivate myself, I challenged Kay Robinson, a good family friend, to a race. She was also planning on running at Leavenworth. 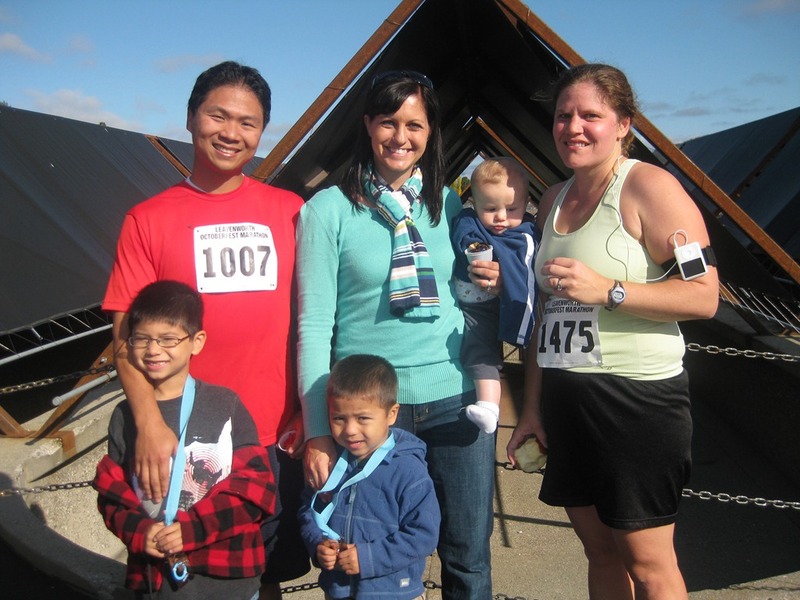 She has run a sub-2 hour half-marathon before (right after having her second baby), and she is perhaps one of the most competitive people I know. Not necessarily competitive in a bad way… but I knew if I threw down the challenge, it would take just about everything I have to edge her out. She gladly accepted and it was on. About a month before the race, I was up to about 7 miles in less than an hour. The fastest I’ve ever run in my life. My mile time was fluctuating between 8:00 and 8:45. I was surprised to hear that Kay had hardly started preparing. But, that was later clarified. She was only running about 5 or 6 miles on a regular basis. She hadn’t “really” started training, yet. I thought to myself – that’s all I’m doing…. what else does training entail? Then a stroke of bad luck. Two weeks before the race, Kay twisted her ankle at the gym. She came over to our house and showed us the big purple monster. I could almost see it throb. I’m sure that she was bummed, but I was also upset. Now, if I win, it’s not really a victory at all! Good job beating the crippled girl. But, even worse – if I lose…. It ended up that she was out for about a week, but this ankle was not going to keep her out of the run. She admitted that it was still painful, but wrapped it up and started running again a week before the race. The night before the race, we all met at the Holiday Inn in Wenatchee (much cheaper rates than Leavenworth). Kay came with her infant son and few other ladies from her ward. Oh, did I mention, she just had a third baby this same year? Tenille was going to watch her baby, Luke, while we ran. On the morning of the race, we got to the starting line about an hour early. I lined up at the back of the 9 minute mile group anticipating that I should be able to pass some of the folks. During a race, I’ve found that it’s much better for the morale to pass people then have a whole bunch of people pass you. Kay was toward the front of the 9 minute mile group. I figured that if we happen to tie at the finish, then this will be good as I’ll get a faster time. Unfortunately lining up in the back did not work out great for me. In most runs that I’ve done in the past, we’ve typically run on pretty wide streets, especially in the beginning where everyone is finding there pace and place. For the Leavenworth course this year, the first mile and a half was on a trail that was barely big enough to fit 2 people shoulder to shoulder. And a lot of people were running side by side… so this was severely hampering my “start off at a fast pace” strategy as I frustratingly and unsuccessfully looked for little gaps where I could pass some of the slower runners. Eventually, the course did open up to a road, and I was able to quicken my pace and caught up to Kay and passed her. I felt pretty good and tried to push my pace as fast as I could. After about 4 or 5 miles, I thought that I had left her pretty far behind. That is until mile 7 where she passed me. I was shocked. I was running at probably one of the fastest clips I’ve ever run (and wondering how long I could keep this up). It was a bit of a morale drainer to see the girl with the busted ankle fly by. For about 1/2 a mile I trailed behind her, but kept her in sight fearing that if I lose her, then I’ll never catch back up. I caught back up to her right before the water stand. I drank down a cup as fast I could while keeping a speed-walking pace then surged forward hitting a monster hill climb. With the fear of Kay burning in my head, I forced my legs to scramble up the hill, convincing myself that I’ll have a chance to recover on the other side. That was the last time I saw Kay. After the race, she told me that she ended up walking up that hill, but then she was right behind me and always had me in her sights. We finished within 20 seconds of each other. She was literally right behind me. It’s lucky for me Kay had a bum ankle, otherwise I wouldn’t have had a chance. I’m sure there will be a rematch, and Kay will whoop me soundly when she runs uninjured. My official time was 1:46:48. This translate to 8:12/mile. This was a time that was faster than I could have imagined. I was aiming for 9 minute miles. In fact, it was so fast, that it felt wrong. And later, we were to find out that there actually was a mistake. We received an email a few days later saying that a course marker was not in place during the first part of the race, and a lot of people missed about .8 miles of the course. That was a huge bummer. However, even at 12.4 miles, the average mile pace comes out to be 8:36, which is much faster than I had hoped for. My sister recently got me a book called “Born to Run” about a tribe in Mexico who are these super-human runners. So far, it’s been a fantastic read not only to learn about this tribe, but also to hear stories about crazy personalities in the running world. Highly recommend. The book has had me thinking about how fast can I “really” run if I tried. It also has me thinking about trying to run barefoot. Seems to be the rage… but I’m a bit skeptical. We’ll see if I’ll actually be willing to shed the running shoes.